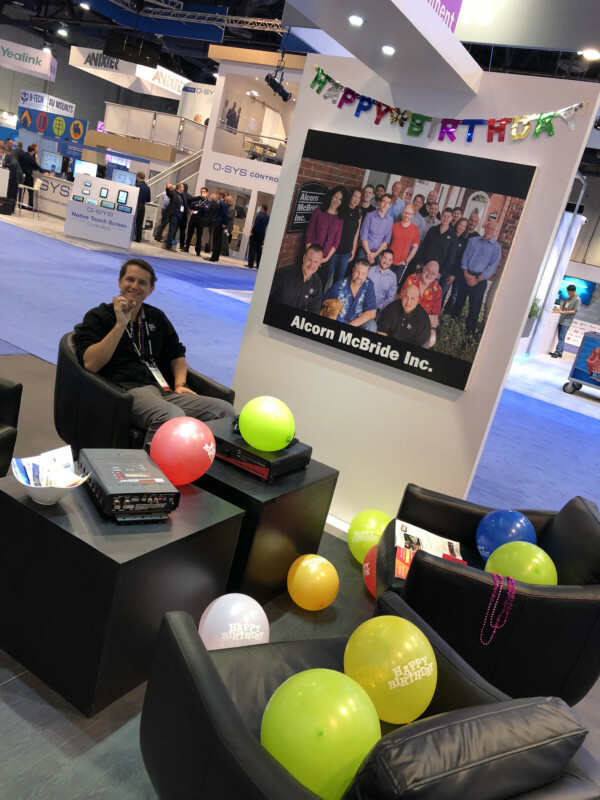 InPark visits InfoComm to connect with and learn from companies and people actively working in themed entertainment and to obtain useful information to share with our business community. According to InfoComm’s official, 2018 post-show report, some 43,000 registered attendees (including InPark) were navigating the brightly lit aisles of the annual, audiovisual trade show in Las Vegas June 6-8. The out-of-home entertainment space is our space, and in that sector, there’s no room for complacency. In themed entertainment, creative and tech work hand in hand from the earliest stages of design; as a result, the technologists are connected to the heart of a project, collaborating closely with the design team. Moreover, the relationship between provider and end user is closer than ever, with manufacturers and other providers setting up verticals within their companies to address the lucrative attractions sector. InfoComm show 2019 will take place in Orlando, June 12-14. 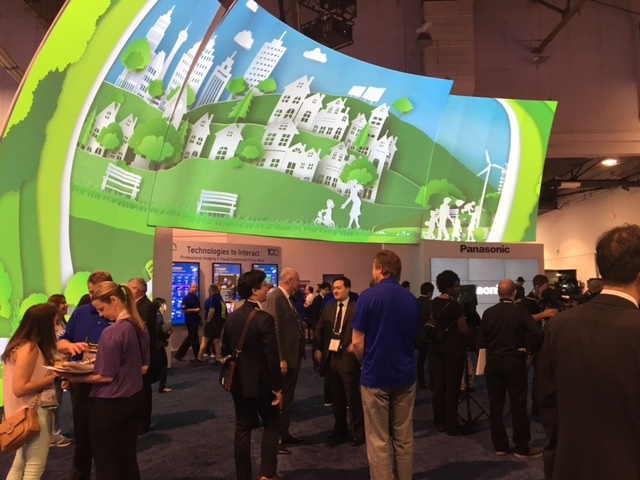 Panasonic products on display at InfoComm 2018 included a new, modular transparent screen that adheres to plexiglass and can add a level of content and interaction to an experience. A new fisheye lens that fills a 180-degree dome screen with a single, 3-chip laser projector such as the Panasonic PT-RQ22K with 20,000 lumens and 4K resolution (shipping in August) was also being demonstrated. According to Fred Mitchell, Territorial Account Manager, Panasonic Media Entertainment Company and Betsy Boesel Sagges, Public Relations Manager, Panasonic USA Corporation of North America, this configuration was created with theme parks, museums and planetariums in mind. It has been shipping since January. Another demonstration showed how the Panasonic PT-RQ32K projector with laser diode technology can project seamlessly onto a range of surfaces. These were just a few of the many riches to be explored in the Panasonic booth. The company’s theme park clients include Disney, Universal and SeaWorld. 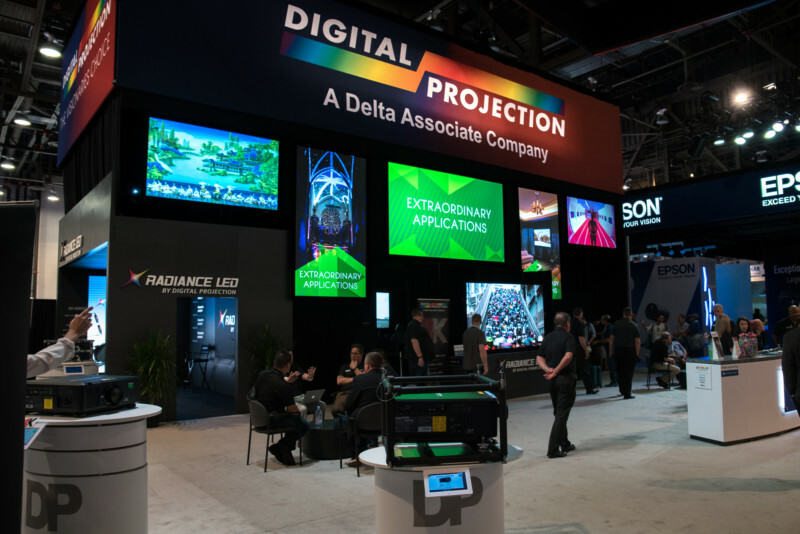 Digital Projection is rolling out a new 8K version of its INSIGHT Laser projector (already available in 4K) and expects the new product to be favorably received in the attractions industry. We were treated to an impressive demo of the INSIGHT 8K, presented by Mike Levi, President, who reported that an early broadcast customer will use it for presentation of the 2020 Olympics (Tokyo). “I challenge you to see a pixel structure on this projection,” said Levi, inviting viewers to walk right up to the screen as he talked about the 33 million pixel display and recommended it for broadcast, video walls, theater, simulation and visualization, planetariums and visitor attractions. It goes into production in July and begins shipping in August with a MSRP of $299,995. Digital Projection is an established and specialized large screen display manufacturer and its planetarium installations include facilities in Atlanta, Alamogordo (NM) and St. Paul (MN), according to Phil Laney, Director of Simulation and Visualization/Product Manager. 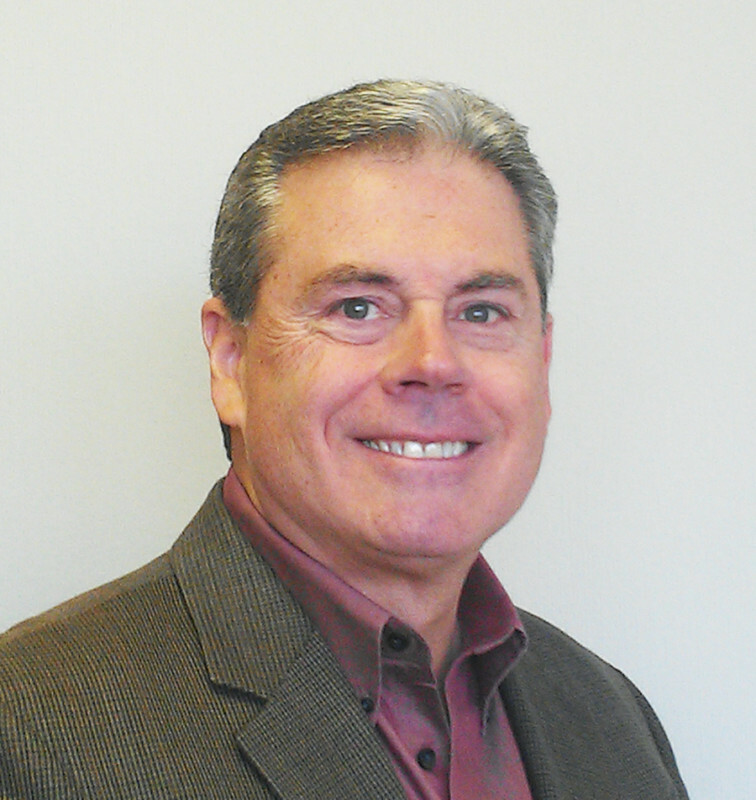 VP of Sales is Chuck Collins. Barco ran a large exhibition stand full of activity. Eric Cantrell, sales manager, A/V control experience & show control, was demonstrating Medialon Showmaster Pro and named several outstanding attributes responsible for the continued popularity of this show control software, such as “being designed for entertainment technicians, and not coders.” Cantrell also pointed out the drag-and-drop interface; timeline-based editing; handling all the protocols; and, when overlaid with Overture, letting the user navigate around the building and tie in the building systems, create an audit trail and more. “An experience center where you have a story to tell is where Medialon excels,” he said. Cantrell joined Barco with its acquisition of Medialon in April 2016 and has been on the front lines of many high-profile projects. “Immersiveness is driving our business,” said Peter Pauwels, director strategic marketing. He described Barco as a manufacturer striving, internationally, to support integrators with superior products maximizing immersion and interactivity. 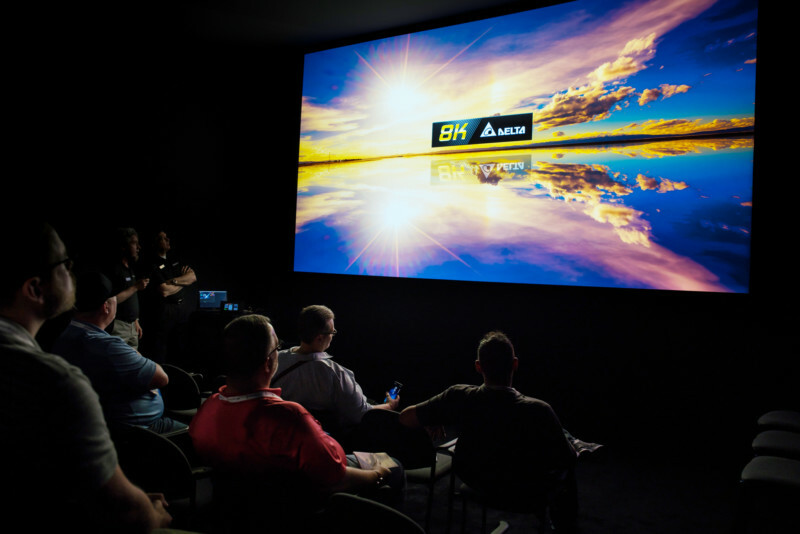 Pauwels reported that last year, the Belgium-based company shipped more than 200 projectors to China, and talked up Barco’s new XDL projector featuring RGB laser and up to 75,000 lumen capability. Barco is active in the Themed Entertainment Association and participated recently in the TEA SATE conference held at Europa-Park in Rust, Germany. Barco will be the Storytelling segment sponsor of the TEA SATE conference at SeaWorld Orlando in October 2018. Demonstrations of Guardian, a new feature that will automatically correct projector alignment even when content is playing, were eliciting great positive feedback, according to Dwyer and Paul. Guardian can be bundled with Christie Mystique™ Install, a proprietary software that configures, aligns, warps and blends complex multi-projector arrays. It works exclusively with the Christie Boxer Series and the new Crimson Series of 3DLP® laser phosphor projectors. 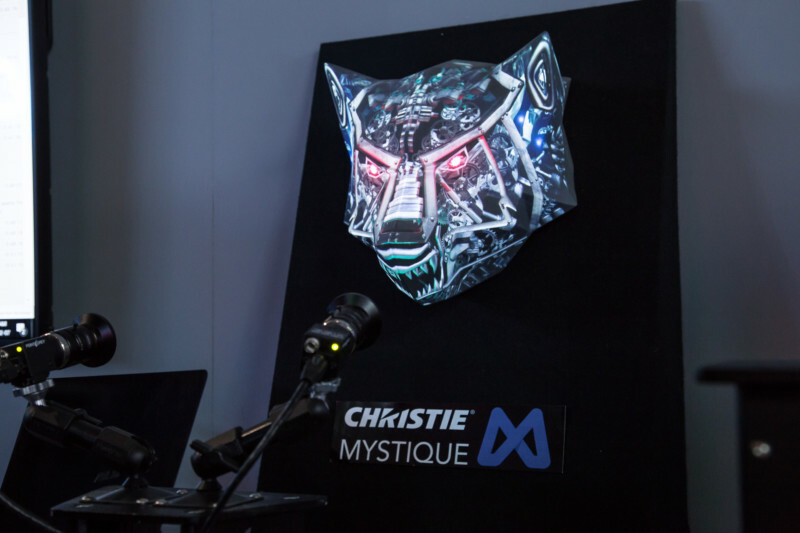 Users of Christie Mystique Install – Large Scale Experience (LSE) Edition now have access to tools such as markerless calibration “so that it is no longer necessary to touch the building’s surface for projection mapping,” says Dwyer. Also being demonstrated were a range of laser projectors from 1-chip to 3-chip, and 10,000 lumens to 25,000. The 1-chip is touted as good for themed entertainment installs, simple displays, projection mapping and museum exhibits. (There are 28 Christie G-series 1-chip projectors installed at One World Observatory in New York City.) We also saw a demo of Widget Designer, a content generating tool available with Pandoras Box server version 6.1. LED tiles were on active display in a range of pixel pitches, in addition to a video wall powered by Christie® Terra; in fact, everything in the Christie booth was being run by Terra, a new AV solution based on SDVoE technology (Software Defined Video Over Ethernet) enabling transport, processing and control of content over 10G Ethernet networks. “It simplifies the system and reduces cost, and there’s no latency,” said Paul, noting that Christie is a leader in spearheading the SDVoE platform. Christie is very active and visible in the visitor attractions sector, with a strong presence in the Themed Entertainment Association and partnerships with major operators. At the Electrosonic booth, from Pamela Manlulu, Event Marketing Strategist, Maurizio Capuzzo, VP Marketing, and Bryan Hinckley, president, we learned that some major personnel related announcements were pending; not long after came the news that Jon Hancock had become the company’s new CEO. In addition to having a booth on the InfoComm floor, Electrosonic sponsored a mixer in downtown Las Vegas, organized by the Themed Entertainment Association Western North America Division – a good intersection of interests as Electrosonic is a leader in AV system design for themed entertainment, with many acclaimed and awarded projects to its credit including NMAAHC, OWO and a distinguished client list including top operators such as Universal Studios. TEA colleagues who attended included John Huntington of the NYC College of Technology and author of Show Networks and Control Systems, Tricia Rodriguez (TEA Western Division president) and Maris Ensing of Mad Systems, Tina Ratterman of Big&Digital, Stephan Villet of Smart Monkeys, Loren Barrows of Alcorn McBride, Melissa Ruminot of The Nassal Company (and president of the TEA Eastern North America Division), Dale Sprague of Canyon Creative (and chair of the TEA Marketing Committee), and Shannon Martin of Color Reflections Las Vegas as well as Alexis Cruz, Sean McChesney and others from Electrosonic. 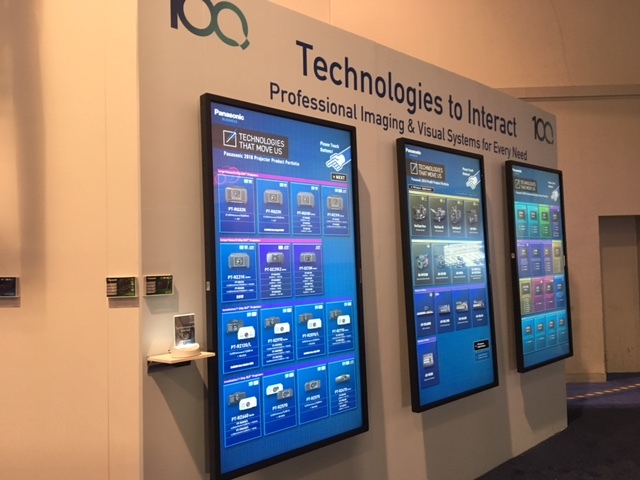 Alcorn McBride Inc.’s Loren Barrows (chief operating officer) and Justin Ruka (sales engineer) talked about the company’s InfoComm displays and demos. There were a range of products created with themed attractions and rides in mind such as RidePlayer, RideAmp, V-Page, A/V Binloop Uncompressed and the new V16X controller. The V16X is a recent upgrade of the company’s flagship show control product, new for InfoComm 2018. It will begin shipping in the fall, and was developed to work with Alcorn’s RidePlayer, with the V16X installed in the equipment rack, and RidePlayer installed on the vehicle playing the content. According to Ruka, customers will embrace the V16X in today’s media-rich, effects-rich attraction environments because it “simplifies integration between onboard and offboard, with fuller communication and smoother synchronization of the system.” RidePlayer, introduced last November at the IAAPA Attractions Expo, is a show controller with 16 channels of polyphonic audio playback included. 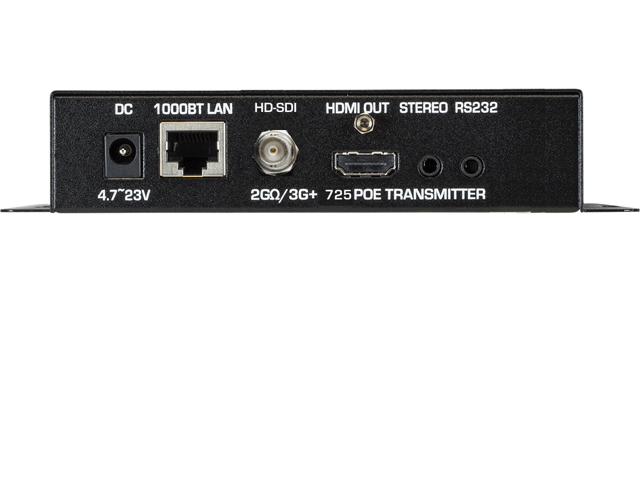 Also new for InfoComm 2018 was Alcorn’s RideAmp, a high-powered audio amplifier that is purpose-built for on-board applications such as dark rides, roller coasters, trams, and parades. It has four high-powered 350 watts per channel and is hardy against weather and vibration. 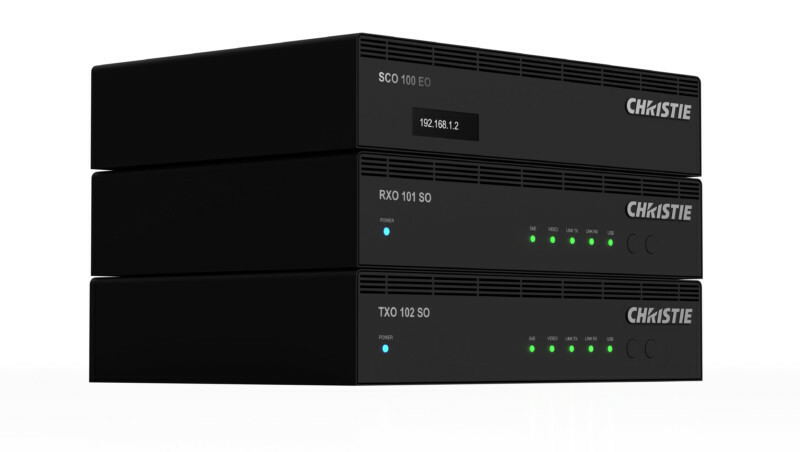 The VPage product, for intercom and paging stations, was also on display and boasting a hardware upgrade and new AES67 network protocol capability, as well as compatibility with QSC and Dante. Sunbrite TV was displaying its Pro Series and Signature series, weather-resistant, high resolution monitors manufactured in California, and specially designed to look good and hold up in sunny, outdoor locations and able to withstand high and low temperatures, and rainy and snowy conditions. “We created the outdoor TV category,” said national product trainer Fred Sharp. Sunbrite TV does international business and has been around since 2004. Sharp reports that the company has hundreds of monitors installed in queuing and concessions areas of Cedar Fair parks, plus installations at Georgia Aquarium and the Toronto Zoo, in addition to numerous sports stadiums, universities and restaurants. Adder Technology was showcasing its KVM (keyboard, video, mouse) hardware solutions, based on a transmitter and control switch operating over an IP network, that enables one user to control multiple computers from a single workstation. This consolidated control typically runs on a gigabit network. A new, more compact model was recently rolled out. Applications include broadcast, command centers and call centers around the world as well as themed entertainment, according to Adder VP Tim Conway. He reports that integrators have adopted the product into control systems for installations at SeaWorld Orlando and the Museum of Science London, among others. Powersoft, founded in 1995 and based in Italy – where all its products are manufactured – serves the professional audio market with state-of-the-art amplifiers and amplifier modules. Its markets include stadiums, sporting arenas, theme parks and airports. Zoos are also a market; recently, 150 of the company’s Deva unit were installed, in weather-hardy casing, on 75 acres at the Cincinnati Zoo, just in time to support its Festival of Lights for the December 2017 holidays, according to Laurence Turner, Deva Regional Area Manger – North America. Deva is a media system that delivers background music, announcements, promotions and paging over a Linux-based server. In addition to working over a network, the units are designed so they can operate independently, each equipped with its own computer, SD card, battery power, solar capability, LED light and camera. 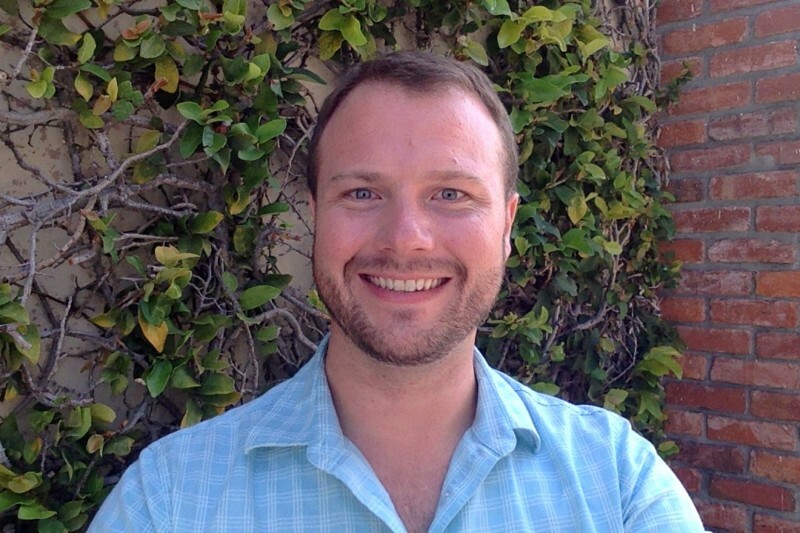 Lightform CEO Brett Jones, whose background is with Walt Disney Imagineering and Microsoft Research, showed us the new, San Francisco-based company’s core, flagship product for which orders are now being accepted. The Lightform unit attaches to a 1080p projector with an HDMI cable. It effectively turns the projector into a 3D scanner and special effects/AR device. The scan data is the basis for creating customized content quickly, using basic photo editing tools, to project back onto objects and surfaces. The device carries a content library and can be controlled in real time with sliders and controlled from a smartphone. Jones sees the product as a needed innovation that will be embraced in retail, signage and themed entertainment, bringing digital messaging and art into real-world settings and creatively transforming spaces without the appearance of screens or signs. The starter kit is packaged with an Epson projector. 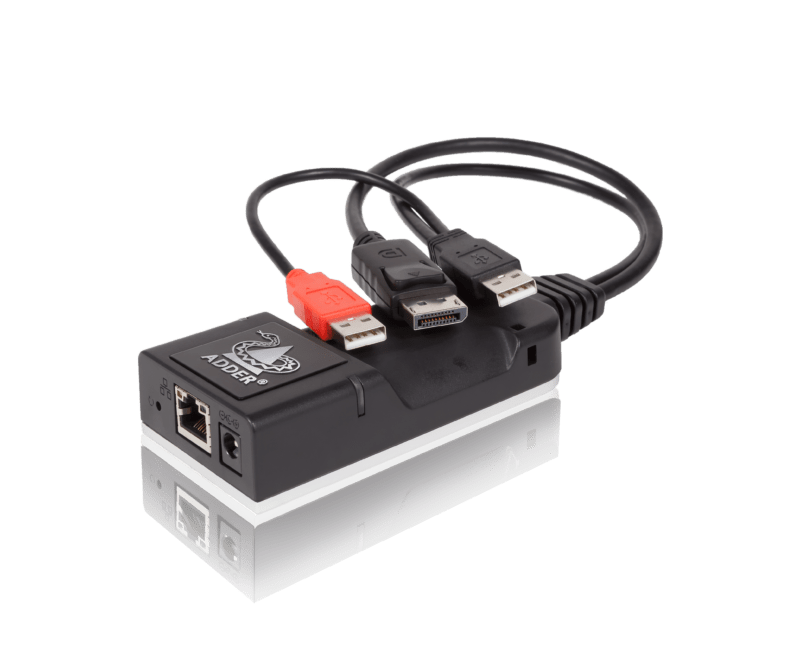 J+P (Just Add Power) is a supplier of little black boxes – controller/distributor units – that attach to monitors and screens to make content work across a wide range of monitors, using AV over IP. CEO and Founder Taft Stricklin is proud of a device that brings an assortment of units together under one control and helps operators get the full life from their monitors: “If it still works, we can make your content work on it,” he said. The Largo, Florida-based company has been in business since 2008 and serves commercial, retail and entertainment markets. Museum installations include the Permian Basin Petroleum Museum in Midland, Texas and the Romero Britto Fine Art Gallery in Miami. 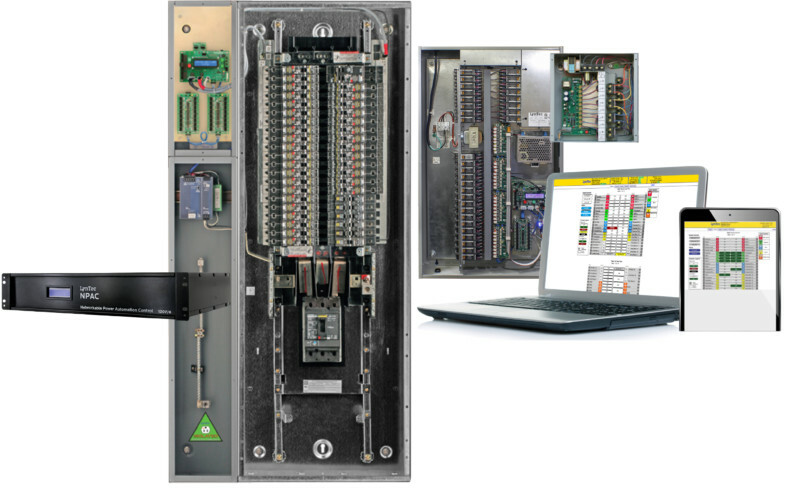 LynTec is a supplier of motorized circuit breaker panels that turn things on and off and speak all the various entertainment and theatrical protocol languages. Mark Bishop, President, reports that Lyntec was recently awarded a patent on the ability to have multiple protocols controlling multiple zones through a central interface. “No one else does that,” he said, “the system is not just for lighting or audio, but anything needing control at the circuit level.” LynTec products are integrated into many museum and performing arts projects, primarily as fixed installations. A past museum project was “You the Experience,” an exhibit at MSI Chicago that received a Thea Award. There are LynTec equipment installations in Las Vegas at the Fremont Street Experience, the Mirage volcano and the Smith Center; and in theme parks including Disney properties, SeaWorld parks, and Dollywood. 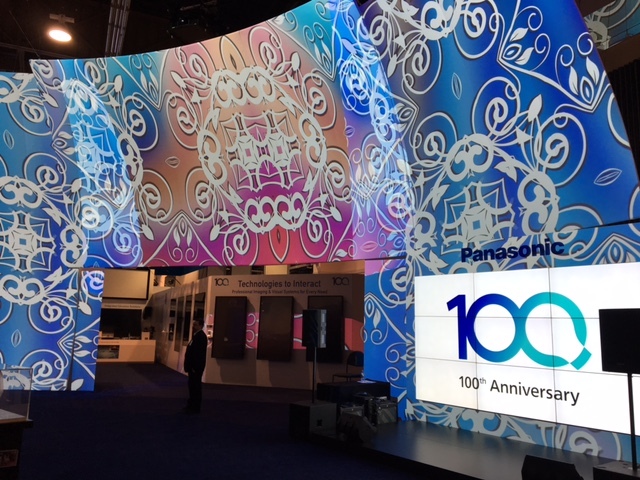 Epson’s Ramzi Shakra, product manager for large venue projectors, pointed out several products the company promotes to the rental and staging, higher education, theme park and museum markets. These included two new laser phosphor projectors; a 4K native 12,000 lumen projector and a WUXGA 20,0000 lumen projector that was being demonstrated with the ELPX02 an ultra short throw lens with zero offset. Also highlighted were the LightScene accent lighting laser projector for digital art, commercial signage and décor applications, and the Moverio BT 350 augmented reality glasses, being deployed in various applications including educational attractions. Barix AG is an audio distribution and control specialist with a customer base across many industries and vertical markets, and according to Reto Brader, VP sales and business development, the company is active in the theme park sector. The company provides flexible technology solutions, and Barix devices can be connected locally via standard networks or via the Internet. Representing the company at InfoComm were Johannes Rietschel, CTO and Founder, William Schmidt, VP of Sales, and Brader. Recent projects include the tram system for Dubai Parks and Resorts, where according to Brader, Barix supplied an intercom and audio control solution to trigger pre-recorded messages via external sources. Barix products include Audio Point 3.0, which facilitates a free app that lets users tune into an audio signal on their wifi devices, with minimal delay. Renewed Vision creates presentation software for unique live events, fixed installations, sporting events, hospitality and more. At the Mall of America in Minneapolis, Renewed Vision’s ProVideoPlayer2, running on an off-the-shelf Mac Mini system, is powering playback for the pre-show video experience of the flying attraction, FlyOver America. The client was Soaring Attractions. A pair of Renewed Vision ProVideoPlayer2 servers are also installed at what’s said to be the world’s first permanent architectural projection onto a swimming pool, a nightly show at the Sheraton Waikiki Beach. The system is streaming nearly 22 million pixels using seven Barco projectors and a pair of MacPro®s. At InfoComm, we met Brad Weston (partner). The company is based in Alpharetta, GA.
ENCO Systems, Inc. provides playout and automation solutions to the broadcast industry and other sectors. Their products and content management systems usually find their destiny via integrator specification, and some land in museums and theme parks, where they help drive auto captioning, speech-to-text or vice versa, video walls, interactives, fountain controls and more. At InfoComm, we met Ken Frommert (president) and Gilbert Felix (broadcast sales, Latin America). The company is based in the Detroit, MI area. Elo is a well-established pioneer of the touchscreen, and the company continues to innovate. According to Luke Wilwerding, director, North America Sales, Elo invented the touchscreen in the early 1970s and has amassed some 550 patents. The company’s markets include museums, water parks and theme parks, for which they offer interactive displays to enhance the guest experience and enable self-service efficiencies. 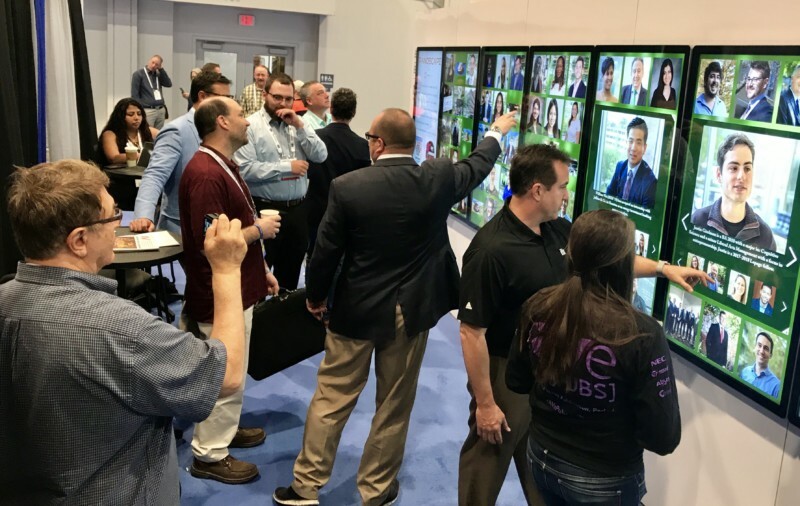 A display of particular interest at the Elo booth during InfoComm was PanoScape™, a patent-pending, multi-functional interactive video wall, designed by Chicago-based DesignCentrix for Tulane University’s A.B. Freeman School of Business and utilizing Elo’s 70” touch displays. 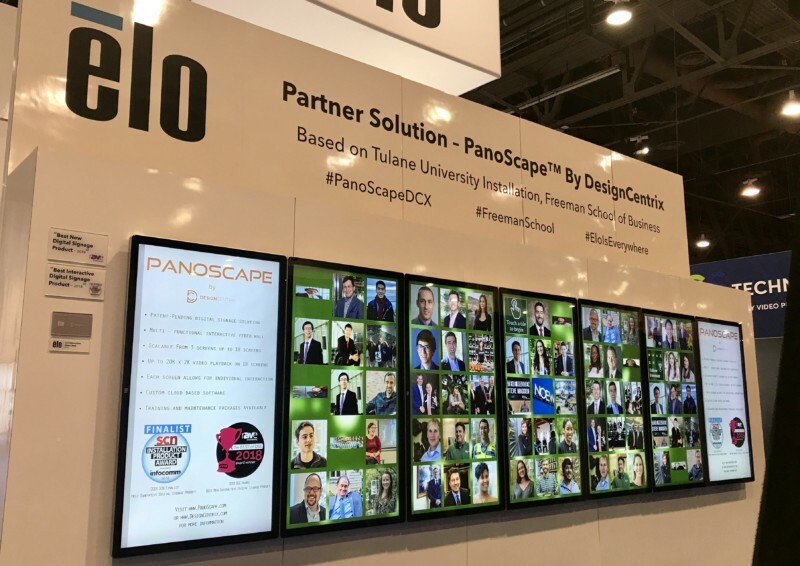 Developed to engage alumni and attract new students, it effectively combined the experience of a video wall with that of an interactive touchscreen to create a living, panoramic video mural that changes constantly with multiple content streams. Jeremiah Fitzgerald and Matthew Mascheri of DesignCentrix explained that they “essentially hacked the traditional video wall, creating a dynamic multi-user interactive experience.” PanoScape™ incorporates a cloud-based CMS along with a proprietary software suite allowing it to play back up to 20K x 2K video files, and with a touch applied to any of the screens instantly switch into interactive mode, where multiple people can interact with unique content on each screen. Other Elo products found in the attractions and leisure industry include Appetize, a point-of-sale app that is deployed at Coney Island water park and other venues, and Nanonation kiosks in use by Nebraska tourism. The company is based in Milpitas, CA.